Many gardeners think that because summer is winding down its too late to start warm weather veggies. 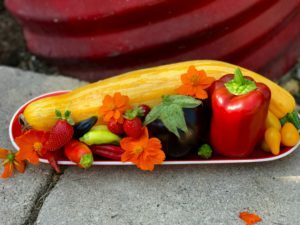 In this blog post I am going share why a late summer garden with warm weather veggies may work for you, and how to know if you have time in the season to start one. I’ll also share what, how, and where to plant to get your late summer garden off to a quick start. Why a late summer garden? A late summer garden gives you something to harvest into the fall. 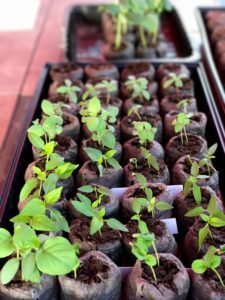 Planting a late summer crop of new, strong plants will give you veggies to harvest into the fall and even into the winter months, if you live in a warm southern climate like I do. 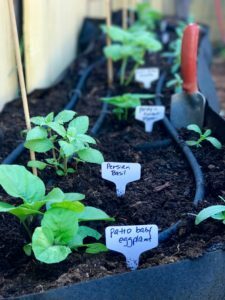 If you live in the southern hemisphere, spring is just around the corner, this can be the start to your spring garden of warm weather veggies. How to know if you have time in the growing season? The key is to know the first date your location usually gets a frost. If you don’t know your first frost date, you can find it on the Farmer’s Almanac frost date calculator for US and Canada. Just enter your zip code and it will give you the approximate date for your area. You’ve got your first frost date, now what? Once you have that date, the key is to choose veggie varieties that you have time to grow from seed to harvest before they are killed off by a frost, or damaged by cold. Red Racer Tomato goes from transplant to harvest in 57 days. For example, I am growing a Red Racer Tomato, a 2018 All America Selections Winner (more about this later). This tomato plant is a quick producer, and goes from transplant to harvest in about 57 days. This means that if I transplant a seedling the middle of August, and my first frost date is October 15th, in about 60 days, I will be able to get a nice tomato harvest before it is killed off or damaged by frost. The summer growing season is coming to a close for many gardeners. Although I grow year round here in So Cal, the weather will start to get cooler in a the late fall. In my late summer garden, since the time is short – I want a harvest quick, before the weather turns cold. Because of this, I’ve chosen quick producing, top performing varieties that are All America Selections Winners. All America Selections (AAS) is an organization that has been around since the 1930’s. Its mission is to promote new, top performing garden varieties. These new garden varieties go through a series of impartial trials where they are grown and assessed against other similar varieties (that are already on the market) at trial gardens all across north America. The new varieties that perform best in the trial gardens are deemed winners and receive the title All America Selections Winner. The varieties I am growing are all AAS Winners, compact varieties, that can be grown in container or in ground. These varieties are quick producers, so I’ll have plenty to harvest before cooler weather hits. 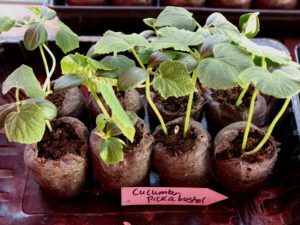 Start your late summer garden the supplies you have on hand – but if you need seeds, following are the AAS winners I am growing and a bit about each. 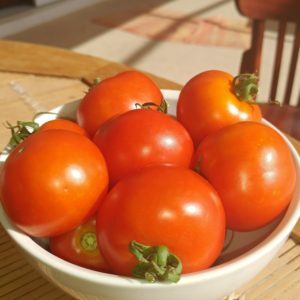 The Red Racer Tomatoe is a gorgeous red, cocktail tomato that produces clusters of red, cocktail sized tomato, (larger than a cherry tomato). This is a determinate tomato (produces all at once, then the plant dies), a compact plant (3 feet tall), and goes from seed to harvest in 90 days. Because it is a brand new AAS winner, seeds are not yet available. Pretty n Sweet Pepper is an “ornamedible”. Pretty n Sweet Pepper is a bright multi-colored compact ornamental sweet pepper. It looks beautiful in the garden and tastes great too! Pretty n Sweet grows about 18” high, doesn’t need staking and goes from seed to harvest 100 days. This “ornamedible” pepper makes a perfect late summer planting for southern gardeners who have a bit more time left in their growing season. 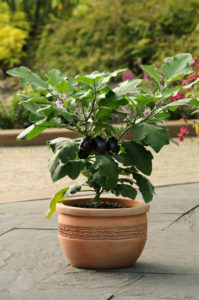 Patio Baby Eggplant – a good choice for containers. The Patio Baby Eggplant produces deep purple fruit that is 1-2 inches in size. This prolific producer is compact, and a perfect container plant. It is thornless, and goes from seed to harvest in 75-85 days – earlier than most eggplant. Don’t you just want to “Pick a Bushel” of cucumbers? How can you go wrong with a name like Pick a Bushel? 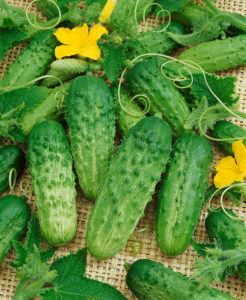 Both Pick a bushel and the Parisian Gherkin are compact plants that produce small, crisp, and sweet cucumbers that are perfect for pickling or fresh eating. Pick a Bushel seedlings almost ready to plant in the garden. These quick producers go from seed to harvest in 50 days. WOW – I’ll be harvesting these before I know it! Persian Basil is late to flower, meaning the tasty leaves can be enjoyed longer. This is a sweet variety of basil with silvery green leaves and is slower to produce flowers than other varieties. (Flowering often causes the basil leaves to turn bitter.) Not only are the leaves super tasty, but the green foliage and sturdy branches make it a beautiful landscape plant as well. 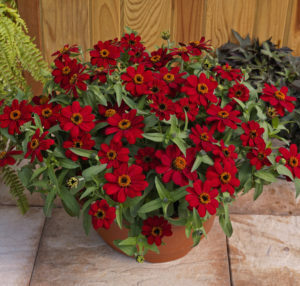 The brightly colored Red Profusion Zinnia flowers will not fade in the hot sun. I’m including flowers in my late summer garden – it’s important to keep the pollinators around so my veggies produce! Zinnias are one of my favorite flowers, and I can’t wait til the Red Profusion Zinnias bloom. These are a compact zinnia – they grow in a mounded shape – 8-14 inches high, and are disease resistant. They have true vibrant red color, a 2 inch flower that will last until frost and will remain true red, and not fade, even in the summer heat. Late summer seedlings off to a quick start in peat pellets. I got off to a quick start with my late summer garden by starting seeds in indoors in peat pellets on a heat mat using indoor grow lights. This provides a more controlled environment so that the seedlings grow stronger faster and I can get them outside in my garden as soon as possible. Smart Pots Big Bag Bed Long adds nearly 11 square feet of growing space to the garden. My garden is full vegetables that have been growing since spring – where to plant? I am growing my late summer garden in a Smart Pots 8 foot Big Bag Long (BBBL) container. It is easy to pop up, fill with soil (I’m using Good Dirt) and gives me an extra 11 feet of growing space! It also comes in a 6 and 12 foot length, and fits perfectly up against my backyard fence, which will shelter the veggies once the weather does turn cold here in Southern California. If you are growing a late summer garden, make sure to check out All America Selections for more information about their winners and where to purchase seeds. 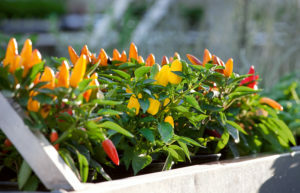 You’ll love growing these top producing varieties in your garden! If you’re a northern gardener and don’t have enough time left in the growing season to grow warm weather veggies, no worries. I’ll also be doing a series on cool weather veggies – some will even tolerate some frost. Stay tuned! Watch the video from my YouTube channel, “Grow a Late Summer Garden” so you can see exactly how to get yours started! ,I will be doing update videos as my late summer garden grows and as I harvest, so please subscribe to my YouTube channel so you get notified when I post an update. Comment below, let me know if you’ll be growing a late summer garden with me with me! Thanks to All America Selections, Smart Pots and Good Dirt for providing the supplies for my late summer garden and for teaming up with me on the “Grow Your Late Summer Garden” series. Thanks for all the great gardening tips. Yes, I will be starting a late summer garden. Great! Keep me updated on how it’s growing! Interesting idea, Kim. Up north here close to the 49th parallel we are seeing much shorter days than in June so even though we still have a few months before the first frost most sun-loving crops are petering out. I wouldn’t even try to plant tomatoes or peppers now (but maybe I’ll try next year in July). However I did have success with cutting down my aphid-invested kale plants and now have new shoots coming up. And pruned my Strawberries last month and they have flowers again. All without having to plant anything new! ? That’s a great point, Marc. The shorter hours of daylight will definitely affect production for some of those summer plants. So glad that you had success renewing your kale and strawberries! Keep me updated on how your plants are growing this fall season and happy gardening! My eggplant is still growing, 3rd planting of tomatoes died, 2nd planting of zucchini and squash has died. I keep trying to get cucumbers to grow, but they die as soon as they reach 1 ft high. Now I am just trying to get some new compost in the garden and get it covered with hay. Next month maybe I can get my fall crops to grow. My first stand of peppers never had blooms, so I cut all the tops off and am awaiting new blooms. It’s funny because I usually have peppers grow and produce from march through january. Not this year. I got one rotted bell and one small edible bell and a handful of banana peppers. Weird year. Have you had luck with cucumbers before? Just a thought but maybe try growing them in containers? This has been a challenging year for many gardeners, but I just love that you are looking at ways to rebuild and renew your soil for new plants this fall. Keep me updated on how your peppers are doing and what fall plants you choose to put in. Happy gardening! I love this article because I just took what I thought would be almost the last harvest of all my tomatoes and peppers yesterday. I was already having that thought of what will I grow for fall. Can you give me some ideas on where I should purchase seeds that are AAS winners? 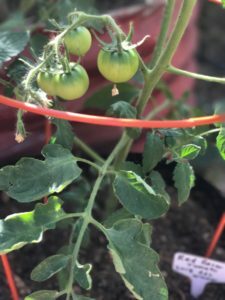 I’m in Palm Beach Gardens, Florida (SE Florida, Zone 10) so I feel like I could get one more harvest of tomatoes and some pollinators going to keep my limited pollinators around. I welcome all your suggestions. Hi, Sonya! So glad that you got a great harvest and are inspired to start a fall garden! You can find AAS seeds on the AAS website here: ​http://all-americaselections.org. They do not directly sell seeds, but they do have a list of distributors there so that you can find your own. I always list links to the different supplies listed in my videos in the video description to make it easier for my viewers to find them. Hope that helps! Keep me updated on how your fall garden in doing and happy gardening! Those types of veggies should do really well this fall season- what varieties do you like to plant? Well the garden is closed up for the season but I have some carrots and radishes growing in containers. I am using your suggestion of raking and mulching leaves and saving them for Spring to use as mulch though. Do you think storing them in paper leaf bags, in the garage will be ok? I’ll provide a quick update: we’re harvesting some strawberries now and my kale plants are lush again. Also my Roma tomato plants were done in the greenhouse but I noticed some new leaves sprouting so I just cut them down to where the new branches are coming out of the main stem and we’ll see what happens. Daytime temps are still around 20-25 C when the sun shines but i don’t think I’ll get any blossoms or fruit this Winter – if the plants survive I might have a head start in spring. I’ll post some photos on Instagram this weekend. It’s always fun to see what plants survive the winter and have a jump on your spring planting. I haven’t tried soy milk for powdery mildew, but give it a go and see how it works for you. Experimenting in the garden is how I learn too. Thanks for visiting me here on the blog! Thanks for providing such great information. I grew up on a farm in the rural south, but haven’t had a garden now in many years since leaving home. You have inspired me to try to LITERALLY get back to my roots. Your information on this blog is so clearly and simply communicated, and I love all your videos. I’m fair to certain you have a heart of gold to go with that green thumb! Please get rid of the email requesting at your home page. Every time I come here, your website want me to give a new email address. And your website isn’t designed very easy to use on my smart phone Google chrome. I can’t find any shopping page to buy seeds. I like your YouTube videos. I feel sorry that your website doesn’t work well on my smart phone.